Our family lives on the peninsula of Osa in the South West of Costa Rica. Leaving from the capital of San José, the Panamerica is leading South over the «Cierro de la Muerte» (3491m above sea level) to the junction of San Isidro – El General. The road continues South (direction «Puerto Jimenez») to the village of «La Palma». From here it is another 2 hours walk or 1 hour ride to our place – the Tamandu Lodge – in the tropical rainforest, about 500m above sea level. 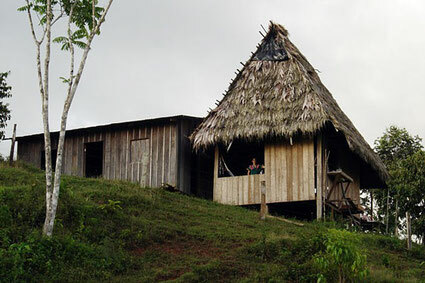 Originally, the Guaymies lived in wooden huts, which were covered with a palm-sheet-roof. They had no floor, so that the Indians lived directly on the ground. The Guaymies dug small ditches around their houses, but during strong rain the ground got partially wet anyway. The people slept in the upper floor of the house. A few years ago the Indians received technical support, in order to build better houses. Now almost every family possesses a wooden building, which stands on short stakes, so that neither the rain, nor animals can penetrate the house. Today the roof consists of metal, which can be easily installed and has a longer life span than the palm-sheet-roof. Nevertheless, each family still possesses another "old-fashioned" house with a palm-sheet-roof, which is mostly used as a kitchen and lounge, as it can get quite warm under the metal roof during lunchtime. They were also assisted with regards to the sanitary infrastructure. Therefore, nearly every family possesses a decent toilet with flushing nowadays. The latrine has retired.